Prime Minister Narendra Modi, who is an avid user of social media, today said from Facebook headquarters that it has huge strengths and benefits which can help governments take corrective steps if any wrong decision is taken. In a Townhall Q&A at the Facebook Headquarters here along with its CEO Mark Zuckerberg, Modi said social media brought about a big change in his thought process. "When I adopted social media, I never knew I would be the chief minister or Prime Minister. I was curious to know the world. Social media helped me gain information about the world. This brought a big change in my thought process," Modi said. "This connected me with the world and the world accepted me as I am," he said. Asked by Zuckerberg if he thought social media will become important tool for governance, citizen engagement and diplomacy, Modi said, "There is a huge gap between the government and the people and by the time governments realise five years are over. But the power of social media is such that instantly you get to know what is wrong. And if it is wrong, government can take corrective measures. "There is daily voting because of social media. Social media a big strength of democracy. I urge all leaders of the world, there is no need to run away from social media. This is the best source for real time information." "If the government is aware, it can take corrective measures with this real time information. Social media has played a big role in governance," he said, adding that if the government goes wrong it gets to know in five minutes that it is not correct and does not have to wait for five years. Modi said social media also plays a big role in diplomacy and cited his experiences of using social media in his interaction with leaders of China and Israel. "China has a different social media structure. I am active in Chinese social media. I greeted Chinese Premier Li Keqiang on his birthday. It went viral on Chinese social media," he said. "I greeted the Israeli Prime Minister in Hebrew. It went viral in Israel. It was fun, when he responded thank you in Hindi on twitter. This is the new face of diplomacy. It connects people of two countries. Social media is a big catalyst of social change," he said. "Earlier it was capitals connecting, like Delhi and Washington, or Delhi-Tokyo. Now people are connected," Modi added. 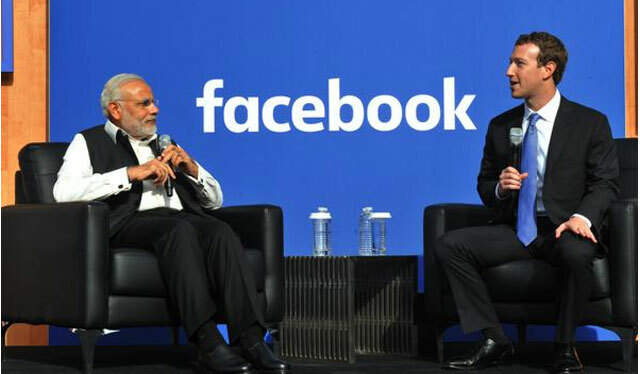 Asserting that India needs to be leader online, Zuckerberg welcomed Modi to the Facebook headquarters. "I am personally impressed by example PM @narendramodi has set in using social media to directly communicate with citizens," Zuckerberg said.